I’ve been using up a lot of tomatoes from the garden lately. Tomato season is coming to an end and to be honest, we’re getting a little tired of eating them with lunch and dinner each day. Instead I’ve been putting them into recipes (along with making tomato sauce etc.). Here’s a current favorite. I make a double batch of this, serve one half for dinner with some homemade bread and freeze the other half for another day. Freezer soups are great for those days when you’re too busy too cook or just not feeling well. Just thaw and heat and dinner is served. The recipe comes from my Freezer Soups and Stews Kindle cookbook available on Amazon. Check it out for even more delicious recipes that freeze well. Place the oil into a Dutch oven over medium heat. Add the onion and cook 4 minutes, stirring often. Add in the sweet potatoes. Stir the chicken broth into the mixture. Bring the broth to a quick boil. Reduce the heat to low, cover and cook 25 minutes. Remove the pan from the heat and stir in the tomatoes. Blend in the white pepper. Pour the mixture into the blender and puree until smooth. Transfer the mixture back to the Dutch oven. Pour the orange juice and water into the pan and blend well. Cook the soup on the low setting for 15 minutes or until heated through. Allow the soup to keep completely before freezing. 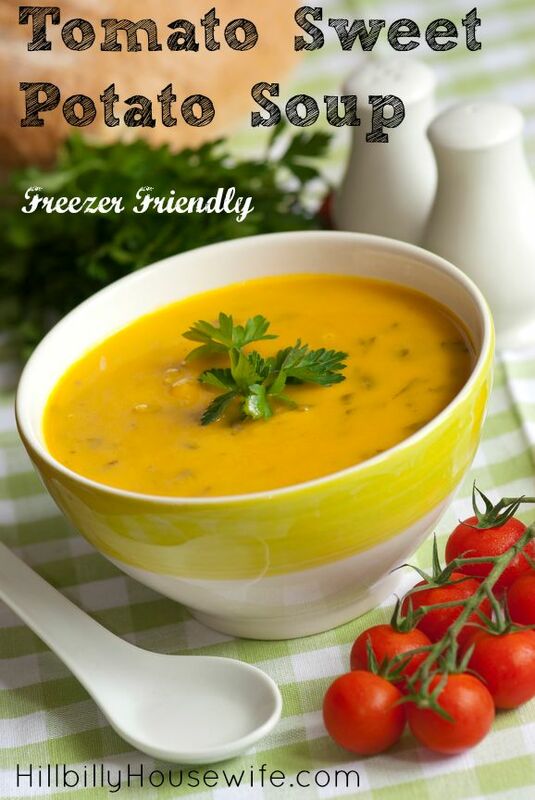 To reheat frozen soup, place the soup in the refrigerator to thaw completely. Pour the soup in the Dutch oven and place over low heat. Cover and stirring often cook the soup approximately 20 minutes or until as hot as you like.